From downtown Beijing the mountains surrounding the city are only visible on the clearest, crispest of days. And given the Chinese capital’s well-documented battle with air pollution, such opportunities are a genuine rarity. 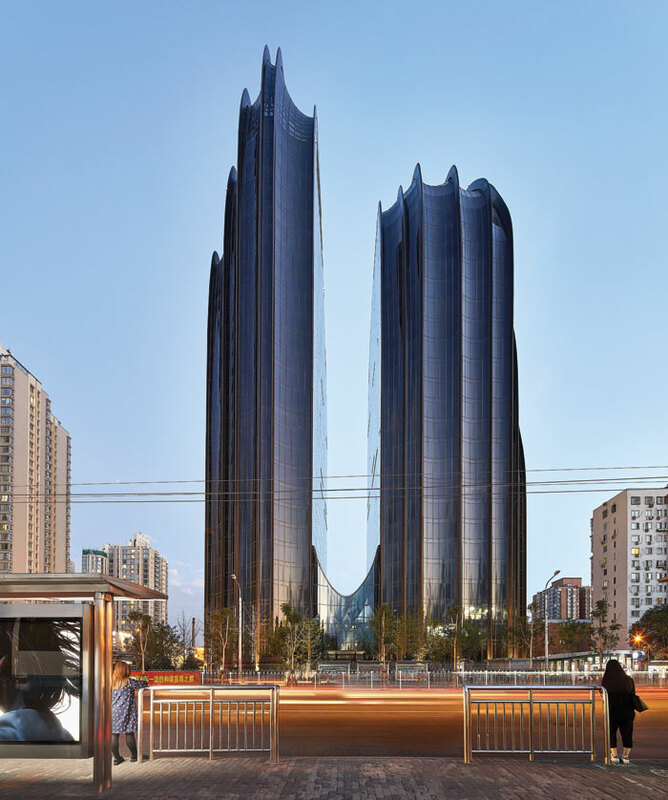 As such, architect Ma Yansong’s Chaoyang Park Plaza project — its form heavily inspired by mountains and nature — often lacks its visual reference point and approaching it by foot is an overwhelmingly urban experience. 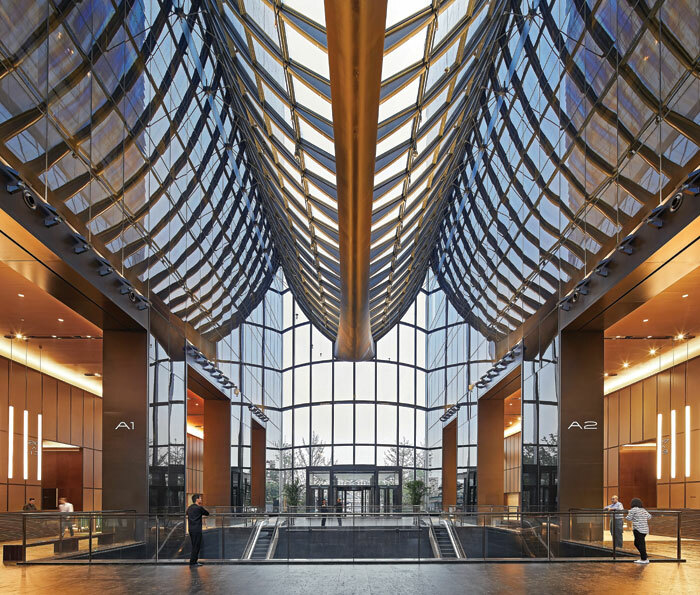 The plaza’s standout structure — an imposing, two-tower building shaped by a series of undulating fins — is curved, asymmetrical and encased in dark-tinted glass. Although captivating to behold, the looming black towers take on an opaque, ominous quality by dusk. In contrast, most of the neighbouring buildings are pale, angular and uniform. And while the Ma’s practice, MAD Architects, is marketing the mixed-use development as being in Beijing’s Central Business District, it actually sits apart from the city’s modest collection of skyscrapers. In other words, the towers cannot help but stand out from their surroundings. And this feels instinctively antithetical to Ma Yansong’s recurrent ‘Shanshui City’ concept — a design philosophy informing some of his works that subtly fuses nature and the built environment while drawing inspiration from traditional Chinese shanshui (literally ‘mountain and water’) paintings. But the Beijing-born architect sees the interplay of natural and man-made forces in more nuanced ways than most. ‘Growing up in Beijing… people were in contact with nature on a daily basis,’ he explains. ‘I would walk across Jingshan Park and Beihai Park on my way home from school. In the winter I would ice skate on the moat of the Forbidden City. 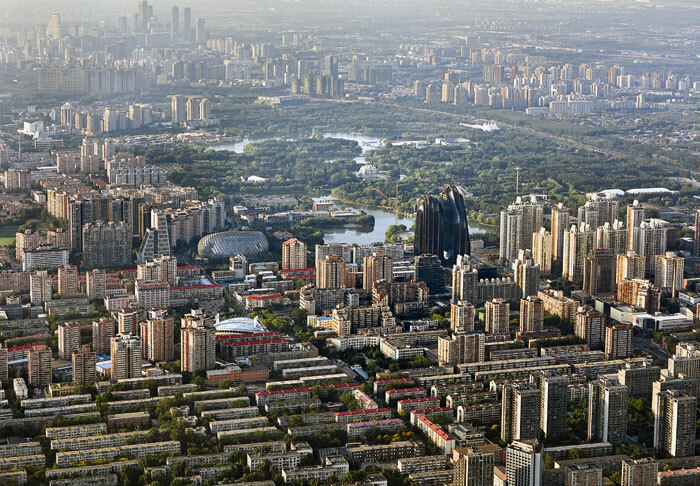 Which brings us to Chaoyang Park, the green space giving Ma’s adjacent development its name. But as a gated, ticketed space, the 289ha park barely feels part of the urban fabric at ground level. This is unfortunate for Ma because, when observed from inside the park, his vision for the plaza comes into sharp focus. From a greener vantage point, the structures’ dark tinted surfaces start to resemble the black ink of the landscape paintings they emulate. The arcs of the park’s lakes and pathways flow effortlessly into the architectural lines. The dipped glass atrium connecting the towers becomes a valley flowing between two weather-beaten mountains. Ma’s allusions to nature stretch beyond the emblematic towers and across more than 30,000 sq m of commercial, residential and public space. The plaza’s eight smaller volumes are connected by gardens and winding walkways open to the public. Each unique in design, the structures are bound together by shiny black surfaces that invoke the polished texture of a pebble. Most striking among them is a residential building comprised of almost 20 irregular tiers, its floors appearing like layers of rock that have all eroded in their own distinct way. Dark, flowing lines carry through the complex. Accordingly, Ma should be applauded for eschewing Beijing’s rectilinear norms and continuing a legacy left behind by the late Zaha Hadid (of whom he was a protégé). Moreover, he ought to be commended for forging an architectural aesthetic that is rooted in Chinese culture and history. Regardless of how successfully Chaoyang Park Plaza articulates this philosophy, it is infinitely more valuable to Beijing than another copy-and-paste tower block. So the fact that Chaoyang Park Plaza stands at odds — for now, at least — with much of the nearby cityscape is not strictly a criticism. The development should serve as a challenge to Beijing, not an affront. After all, the Shanshui City will not be built by one architect alone.